In 2012, the US House of Representatives voted overwhelming in favor of more transparency in monetary policy by supporting an audit of the Federal Reserve. House Resolution 459, Audit the Fed, enjoyed the cosponsor ship of over 100 representatives and passed the House of Representatives 327-98. Yet, the Senate didn’t even give the bill a second glance. Despite Harry Reid earlier warning about the Federal Reserve, he blocked the legislation from any discussion or vote on the Senate floor. However, in 2013, Senator Rand Paul’s has reintroduced the bill, S. 209, to bring transparency to the Federal Reserve. While the house retains a lot of support for a full audit, the Senate currently has only 24 co-sponsors. Stand with Rand and 80 percent of Americans who favor auditing the Federal Reserve to create more monetary oversight. 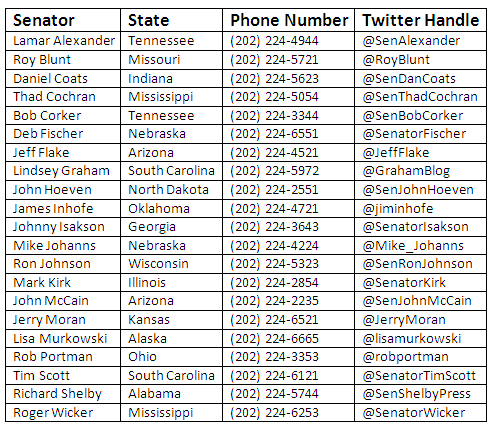 Respectfully urge the Republican Senators (below) and Democratic Senators to support S. 209 to bring increased transparency to the Federal Reserve. There are four current Democratic Senators who voted for H.R. 459 when they were members of the House in 2012: Senators Tammy Baldwin (WI), Joe Donnelly (IN), Martin Heinrich (NM) and Christopher Murphy (CT). Baldwin not only voted for but also cosponsored H.R. 459. Democratic Senator Mazie Hirono (HI) was not present during the vote for H.R. 459 but she submitted a statement into the Congressional record stating her full support for H.R. 459. These are five Democratic Senators we need to target to cosponsor S. 209.